Muchos Respectos continues to thrive on his new vocation as a sprinter after the gelding completed a double for the Danny O'Brien stable at Wednesday's Geelong meeting. The son of Pins took a modest record of two wins from 15 starts into the Baby & Child Country Showcase Handicap (1200m) but six of those were failures over a mile in races such as the Group 2 Bill Stutt Stakes. Muchos Respectos broke through over 1200m two starts back at Cranbourne before repeating the effort in Wednesday's $22,500 Rating 72 race. Jockey James Winks parked Muchos Respectos ($4.60 fav) behind the tearaway leader Side Splitter before the four-year-old surged past his rival to post a decisive win. 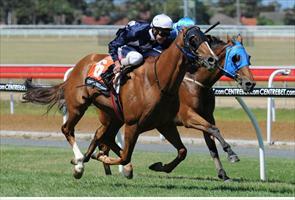 The victory was Muchos Respectos's third over 1200 metres. "He gave me a lovely ride,” Winks said. "They (the O'Brien stable) have probably found the key to him. "I worked him the other morning and he went beautiful and he did the same today. He was a gentleman to ride. Muchos Respectos was O'Brien's second winner for the day sired by the Waikato Stud sire Pins after Higuain ($3.30 fav) broke through for his first win at the fifth attempt in the Geelong News Maiden Plate (1500m).